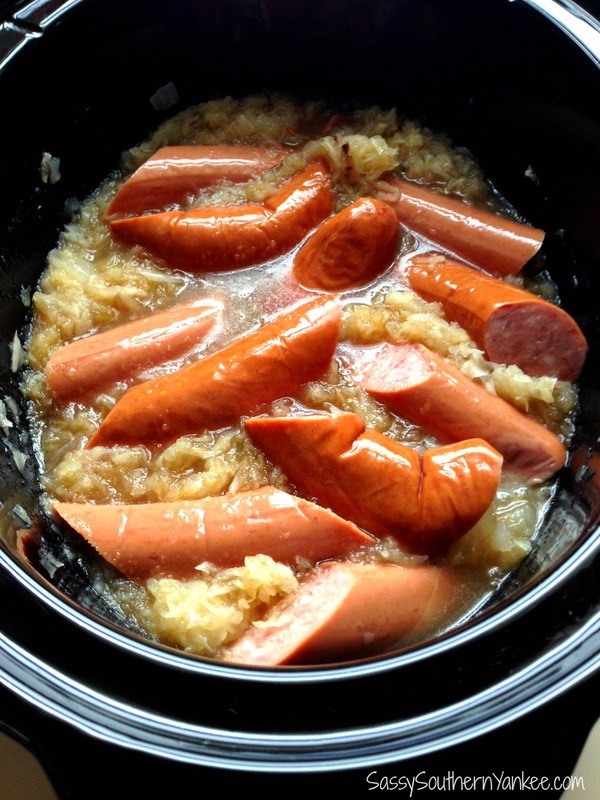 This Crockpot Bourbon Brown Sugar Sauerkraut and Kielbasa is the perfect week night meal. It’s our southern twist to an old Polish favorite! Apples, Caramelized Onions, Brown Sugar and Bourbon whats not to love? I’ll be the first to admit when I was younger my dad would make sauerkraut and kielbasa, and I would cringe. I hated it the smell, taste and texture! He has a bit of a sweet tooth, and would pour in brown sugar, and maple syrup it was like eating candy coated cabbage. Well I finally have tweaked my recipe to what I would almost consider perfection. It’s the perfect balance of sweet and sour with a hint of smokiness from the kielbasa. 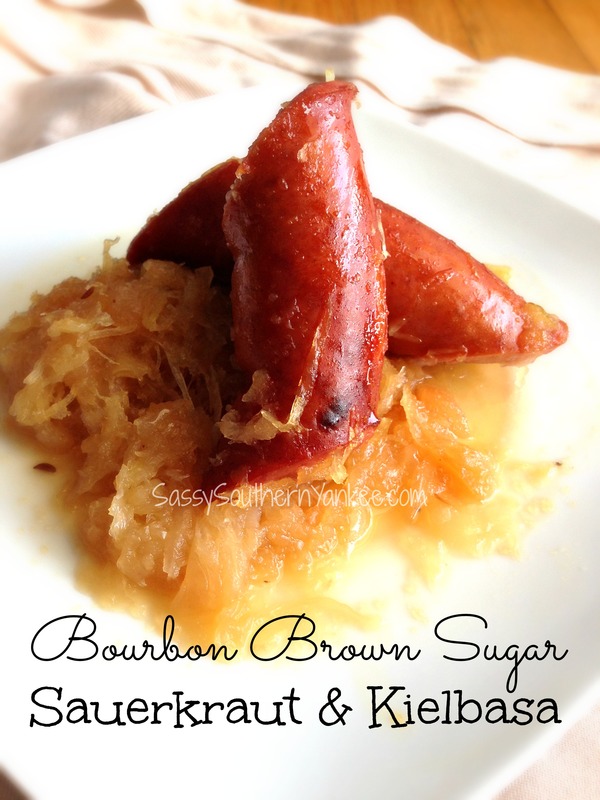 Give my Bourbon Brown Sugar Sauerkraut and Kielbasa and let me know what you think! ***If you are allergic to Gluten Please read this before using Bourbon in the recipe as each person reacts differently to distilled alcohol. Ok let’s get started. First let me say that you can make this recipe easy or super easy. I will let you pick! I love caramelized onions so I diced the onions then sautéed them in a pan until they became golden brown (the easy method). If you are pressed for time and want things super easy then just chop up the onion and throw it in the crockpot. You can decide but the caramelization of the onion does add a deeper flavor. Next chop the Kielbasa into pieces. I like mine a bit longer about 4-6 inches but you can chop them into whatever size you like. Place the kielbasa into the crockpot. Add all of the remaining ingredient into the crockpot (brown sugar, bourbon, applesauce, sauerkraut). Stir the Bourbon Brown Sugar Sauerkraut and Kielbasa mixture. Cook in the crockpot on low for 6-8 hours or high for 3-4 hours. Depending on your crockpot you might want to add 1/2 cup of water to avoid scorching. Mine was fine but as we all know every crockpot is different. This Crockpot Bourbon Brown Sugar Sauerkraut and Kielbasa is the perfect week night meal. It's our southern twist to an old Polish favorite! Apples, Caramelized Onions, Brown Sugar and Bourbon whats not to love? Ok let's get started. First let me say that you can make this recipe easy or super easy. I will let you pick! I love caramelized onions so I diced the onions then sautéed them in a pan until they became golden brown (the easy method). If you are pressed for time and want things super easy then just chop up the onion and throw it in the crockpot. You can decide but the caramelization of the onion does add a deeper flavor. 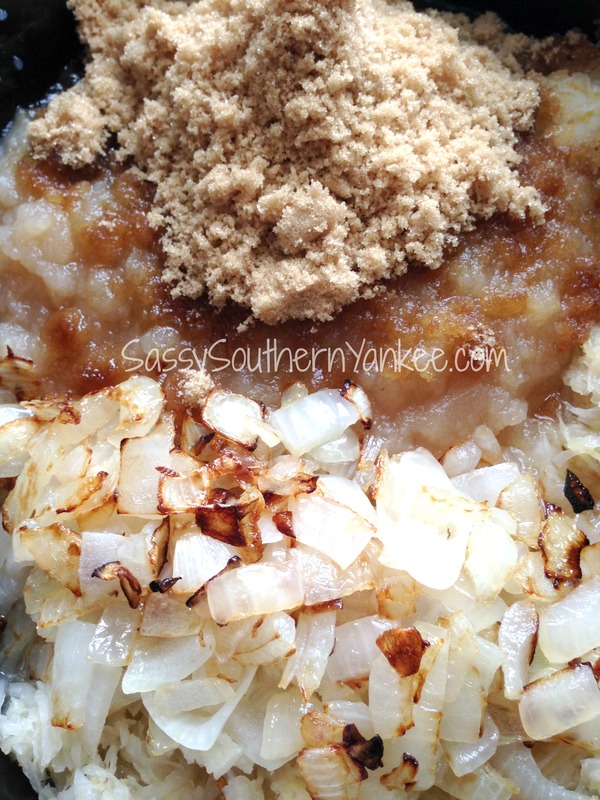 Add all of the remaining ingredient into the crockpot (brown sugar, bourbon, applesauce, sauerkraut). Stir the Bourbon Brown Sugar Sauerkraut and Kielbasa mixture. Cook in the crockpot on low for 6-8 hours or high for 3-4 hours. Depending on your crockpot you might want to add ½ cup of water to avoid scorching. Mine was fine but as we all know every crockpot is different. This entry was posted in Main Course and tagged Bourbon, Bourbon Brown Sugar Sauerkraut and Kielbasa, Brown Sugar, Crock Pot, crockpot, Kielbasa, Polish, Sauerkraut, Southern Twist.